I recently had the privilege of meeting Julie and her sweet boy, Jaxson. Julie wanted photos of her little guy since he had just turned one, and after talking we decided that an in-home session would be best (because this winter weather is crazy!). She opened her home to me and allowed me to follow her little guy around, documenting a couple hours in his ordinary, day to day life... And you all, I fell in love with everything about this session. Jaxson's personality shined in the comfort of his own home and I was able to capture honest and real details of who he is and a piece of what "life" looks like during this season.. And I have to say I think it's pretty special. My hope is that one day, when Julie and her husband look back on these photos, they will be reminded of the wonderful memories of their precious boy during this time. How he loved standing and looking out the window, reading books and playing with the remote (what child doesn't love the remote?!). I hope they remember the sweet details of his long eyelashes, chubby little hands and feet and his wild, curly hair. I hope they laugh when they remember the way he used to climb up and sit inside the ottoman and watch tv so intently, and the serious look on his face when he played with his toys and explored. And more than anything, I hope that this mama looks back on this time and sees that the faithful ways in which she served and cared for her baby boy, day in and day out, were well worth it. Some days we aren't able to see the worth of our job as mothers. Amidst the dirty dishes, piles of laundry, toys scattered everywhere and mouths to feed, it can be hard to remember this job is sacred and the most important thing we will ever do. 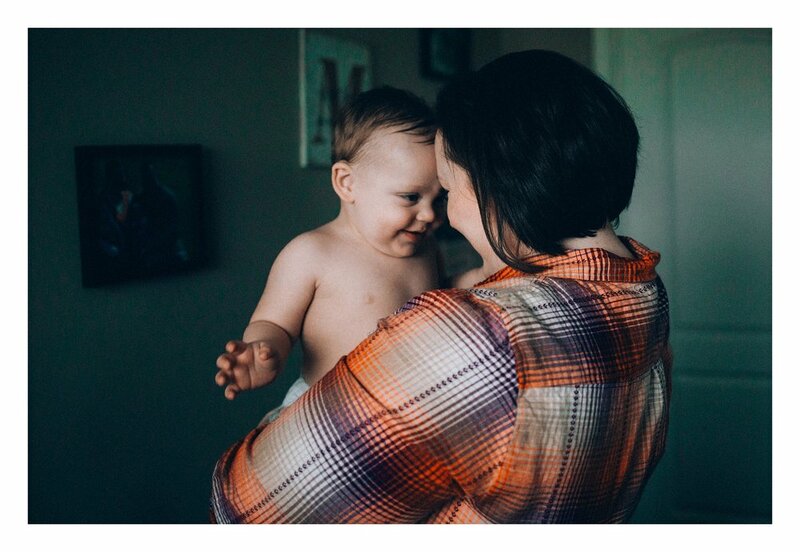 Beauty radiates from the mama in these photographs as she loves and cares for her sweet boy, and one day Jaxson will see these captured moments and have tangible memories of his mother's love for him and the connection they've always shared. What a thoughtful and meaningful gift these photos will be to him one day. Happy Birthday, sweet Jaxson boy! If you're interested in documenting some of your own family's real life memories I'd love to hear from you.